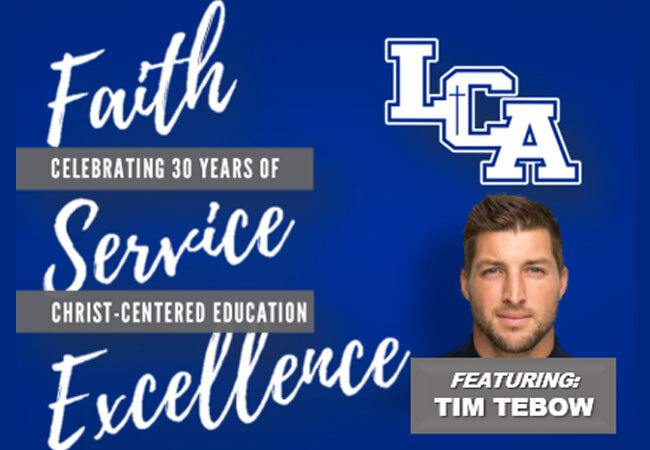 For more information on Tim Tebow’s speaking engagement, please contact Lesley Sizemore-Hardin at [email protected]. For more information on VIP packages and sponsorship information, please contact Terry Johnson at [email protected]. For media inquiries, please contact Dan Koett at [email protected]. Lexington Christian Academy is a private, non-denominational Christian school located in Lexington, Kentucky and accredited by AdvancED. LCA has been nurturing and educating young people from a distinctly Christian worldview for over a quarter-century. From a small group of committed parents holding classes in local churches, LCA has grown to a nationally-acclaimed learning institution of nearly 1,500 students in grades preschool through 12 located on a beautiful 75 acre campus with state-of-the-art facilities in the heart of Lexington. Academically, LCA students consistently place at or near the top of all schools in Kentucky, as evidenced by standardized test scores, scholarships and post-graduate accomplishments. Extra-curricular activities are wide-ranging and continually reaching new levels of success, particularly in athletics and fine arts.